A rocking horse. 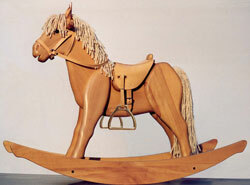 A beautiful wooden rocking horse. Memories of childhood come flooding back. There is a magic which touches something deep inside us. To fall in love, it scarcely seems to matter if you are three, forty-three or eighty-three years old. There is a hint of a bygone age, but this is something which is simply timeless! 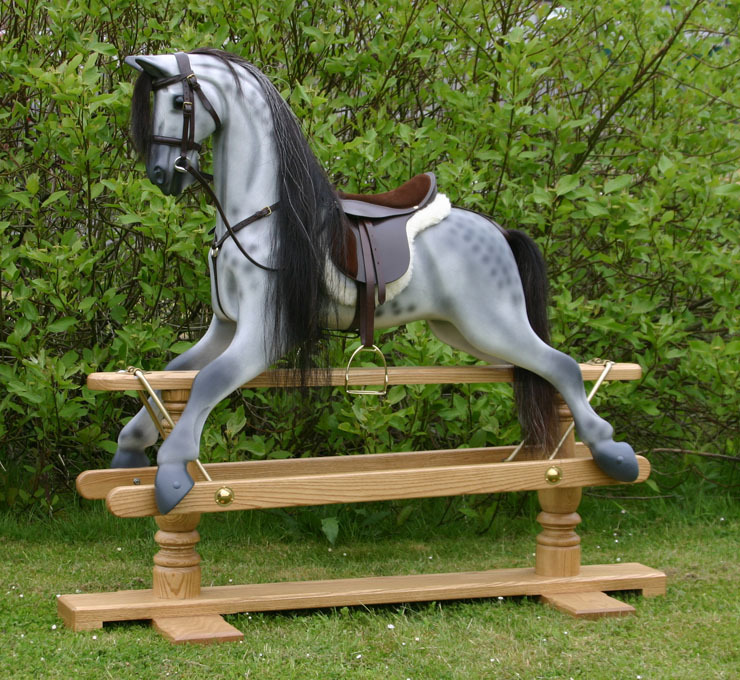 Our world class stable in the UK includes some of the world's finest hand made rocking horses. We offer you superb quality traditional wooden rocking horses for sale. 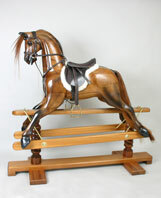 Please browse this site for a taste and a big step on the way to choosing the right rocking horse, not just any one. 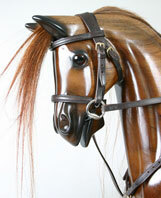 Our team comprises top carvers of 'Victorian' rocking horses and antique rocking horse restorers. A skilled and experienced classic rocking horse makers creates beautiful, friendly hand carved rocking horses in many styles and sizes, including miniatures. 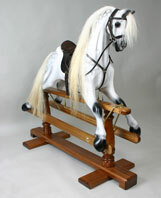 Buy a handmade rocking horse by top contemporary makers or choose from antique rocking horses. Our hand-made rocking horses are complimented by some excellent smaller rocking horses for young children. These lovely little creations are adored by children. Superbly crafted like their big brothers and sisters in our stable, these excellent wooden rocking horses include the award-winner: "Europe's Favourite Rocking Horse" (see bottom left of page). We are a friendly team and pride ourselves on giving you a warm welcome and personal service regardless of whether you are in the early stages of deliberating or are ready to make your choice. Please contact us for information, guidance and friendly advice without the slightest obligation. We take great care to ensure that our photographs are an accurate depiction, but we can often make arrangements for you to visit our showroom and rocking horse shop in rural Sussex or to view elsewhere. Whether you are thinking of buying for an adult or for a child, you can meet some of our creations in the flesh and chat in a relaxed atmosphere. And you never know, you just might fall in love! If you own a vintage or antique rocking horse which requires repair and restoration, we are experts in antique rocking horse restoration. 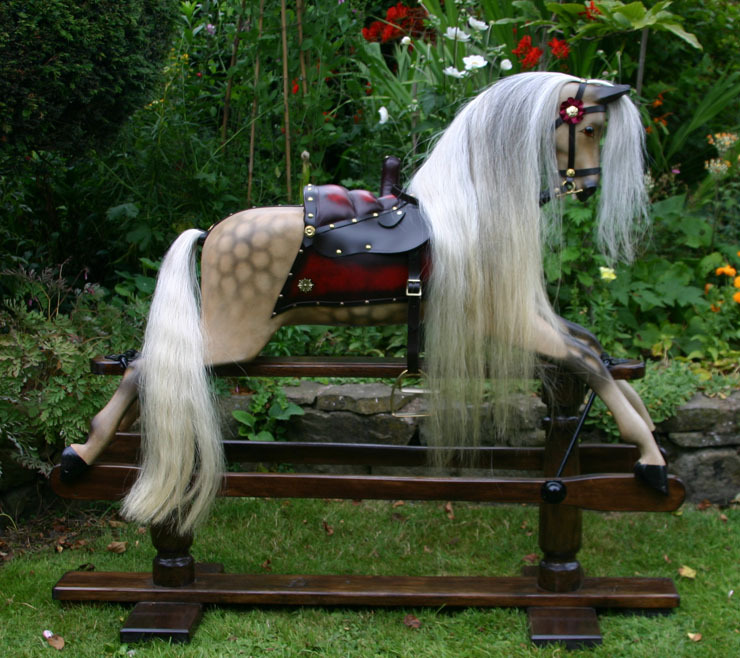 Our team of experienced antique rocking horse restorers can repair and restore your old favourite to former glories. Rocking horse renovation is a specialised skill, so please ensure that you entrust your horse to experts in the field or you may come to regret it. Our senior maker celebrated twenty-five years of craftsmanship with a small range of extraordinarily detailed creations, which eclipsed even the finest extra-carved antiques of yesteryear. This exclusive silver range was available in very limited numbers. We believe them to be the most detailed ever carved. One of our creations was dressed in haute couture by Jean Paul Gaultier in his inimitable fashion and attracted a winning bid of £80,000 when auctioned by Christie's at the Russian Rhapsody charity gala in London in aid of the Naked Heart Foundation, the children's charity founded and managed by Russian supermodel Natalia Vodianova. Whether it is a full sized traditional rocking horse or something smaller for a young child, you may only ever buy one, so choose the right one by turning specialists. Our lovely range offers you superb quality, choice and value. Please contact us for details of prices and availability. Please bear in mind our showroom and rocking horse shop. The beautiful, individually hand-made Chester is made without compromise and acclaimed as the very finest available. Selected hardwoods, saddler-made tack in Sedgwick leather, flowing manes and tails, deluxe accessories and, above all, wonderful craftsmanship by Britain's most accomplished rocking horse makers all come together in our Chester hand made rocking horses. 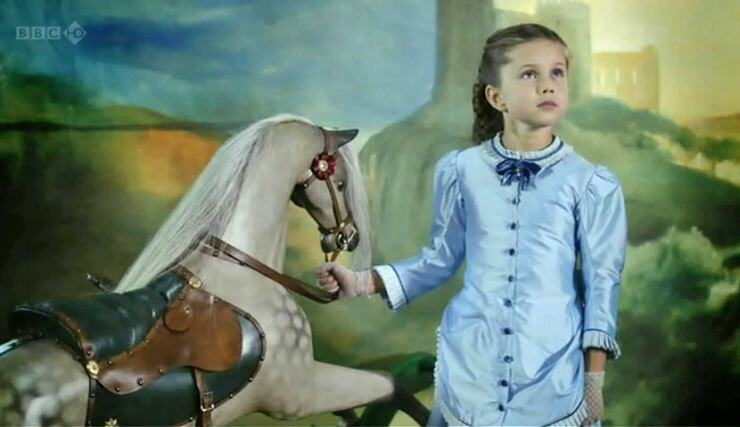 You can view a video of production on our rocking horse videos page. We make the world's finest hand made rocking horses by experienced, professional rocking horse makers who use the finest timber and accessories and make to the finest standard of craftsmanship. 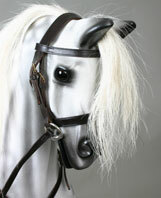 Sussex rocking horse shop for London, Surrey, Kent, Hampshire, Essex rocking horses. Dorset rocking horse restoration. The magnificent 19th Century bow rocker pictured above has been splendidly restored to full working condition and is now offered for sale. Originally owned by the renowned, wealthy and influential Phillips family in Lancashire, the horse has a fascinating provenance and also featured in the BBC 2 adaptation of Michel Faber's novel "The Crimson Petal and the White". Price and further details on application. The photo above shows the latest lovely Chester as he emerged from the workshop recently and before he galloped away to a delighted customer! Please note the detailed hand-carving which differentiates these horses from the overwhelming majority of others. Customers often admire the carving detail and contrast that with some of the boxy alternatives with limited carving and whose legs have come straight from a band saw. This would make a mighty stallion for an energetic boy and melt the heart of any little girl. But can I let you into a secret? He actually spends most of his time melting the hearts of grown-up little girls and finds his way into at least as many adults' living rooms as he does children's bedrooms. And often, there is not a child in the house. Or not as you would know. The photo above shows a beautifully restored antique rocking horse of the highest standard which has just been released for sale. This is a quite superb horse, which stands 46" from the floor to the top of the head, and has been restored to "better than new" condition structurally, but has a lovely patina too. Full details on application. Similar horses in other sizes are often available as well. © The Kensington Rocking Horse Company 2018. All rights reserved.